Malawi national football team head coach Ernest Mtawali has warned all players that nobody is guaranteed a place in the starting line up. He was responding to the recent public outburst by Flames and Platinum Stars midfielder Robert Ng’ambi who vented his anger on the coach after warming the bench for the entire 90 minutes during the two-all-draw in the 2017 Afcon qualifier against Swaziland a fort night ago. Speaking during a press briefing at Chiwembe Technical Centre on Thursday morning, Mtawali said he will only call a player based on his form and discipline. Mtawali (in black tie) says all layers are equal. “Robert Ng’ambi is one of the best midfielder we have had in Malawi. He has been influential for the team and I called him because of his leadership skills and discipline. “I don’t want to talk about him but all I can say is that nobody is guaranteed a place in my first line up. Players have to fight for it,” he said. He also added that the door is not shut for the dropped senior national team players. “The door is not shut. 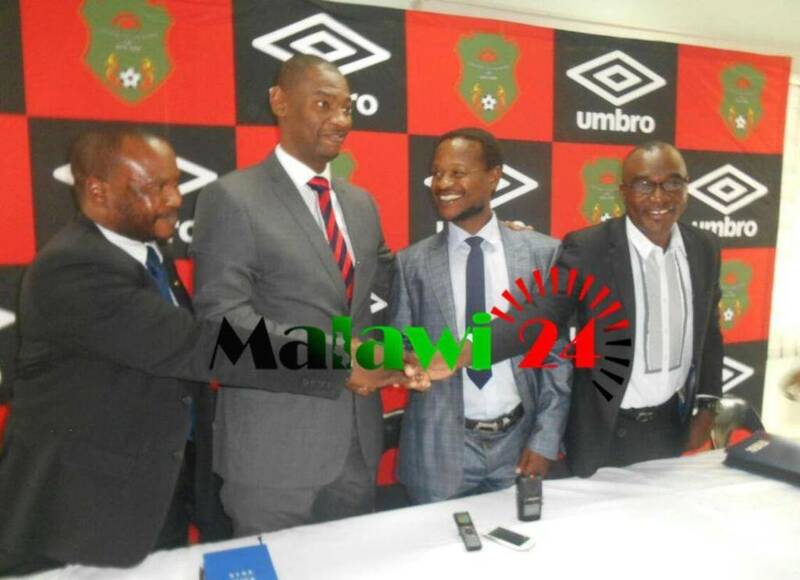 If a player is in good form, he will be called into the team,” continued Mtawali. On his team’s preparations, the former Mamelodi Sundowns midfielder said new players like Fisd Wizard’s Levison Maganizo and Mighty Wanderers’s Kondwani Kumwenda and the rest of the players are performing well. “Overall, the players are in a very good shape. I am very impressed with Levison Maganizo and Kondwani Kumwenda as well as Deus Mkutu. Their performance is very good and everything is going according to the plans,” he concluded. but please dnt forget #Mwai_Kumwenda for the bst results…. team yathu ili bwino koma vuto ndi zigori komaso kuteteza zigori tikachiya. “No player is guaranteed a place in the first eleven” yes, agreed but keeping Robert Ng’ambi on the bench is daylight suicide. Ng’ambi is one of the best midfielders we have at the moment. He is a regular player for Platinum Stars and oftenly scores. It is total mockery to keep him on the bench unless he’s injured. Let’s put aside any grudges if they exist otherwise we are going nowhere. Let’s utilise well our hard earned resources by doing the right thing. I agree we have other good players but we badly need experience to win games. After losing at home to Zimbabwe we were supposed to win the game in Swaziland. Upite ku Ganah aliyense amadziwa 1st eleven,Nigeria,Zambia and many more. Nanga bwanji mpaka lero kumalawi tilibe 1st eleven? Thats y timangoluza. Lero wina mawa wina so maplayers agwirana bwanji? One of the first 11 is Stanley Sanudi from Wanderers. A Malawi kod munatani musamusokoneze coach apange maganizo ake inu mukufuna mumupangire lineup,mufuna atengeso zakale zoluza ife tikufuna new blood mu flames osati tiziva zakale,ikaluza nomwenu mudzat amatenga zakale ikawina mudzakamba zina,draw ya swazland mukanakhala ng`ambi wanuyo bwez titaluza. Including captain? So supporters will keep on watching experimental players & assessing experimental coaches? Uchite nao maka ma veteranwo asajaile. Takhala tikuluza iwo alipo ndie akuti chiani? All the time we are building a team ena mpaka nkkumakalamba still building a team, till when?? To include or not to Include is not an issue here guys! In business world, you need to carefully choose a strategy which brings desired results. Therefore, as to whether the Flames mentor will or will not include whoever, it’s none of our business, all we want as a nation is ‘Flames must be winning their games’. Period! musieni mtawali apange zomwe akudziwa. kodi kuli young chimodzi samasewera ng’ambo o? nanga ngati amasera kulowaso moyamdirira imaluziranji team i? Mupatseni kae mpata wama game angapo kenaka mudzayambe kulankhula. Coach amaitana m player ambili kudutsa 11 mukuganiza onse angalowe. Timu yathu yakhala sikuchita bwino a Bajo ali momo .Timpatse mpata ayese ena kuti apange timu. Ma player ena satulusidwa ngati kwa azungu mukunenako ngati team ikuchita bwino.Nanga mmene ili yathuyi mungayelekeze neyma wanuyo. Palibe player wamkulu kuposa flames. Coach ndi nthawi yako gwila ntchito ndi mzeru zako. Mwina Nkutheka Tanzania Kudusa Koma Algerian Mugadutsee? ? ? ? ? ? ? ? ? ? ? ? ? ? I like Mtawali’s philosophy!! Coz This has brought Competition among the players Locally even Those who are Outside they nid 2 work 2 Guarantee a place in the Squard!! Zomatengela maina zinatha now we nid perfomance..If doesnt perform @ Club level then there is no chance for U..Period!!!! Ng’ambi Is a regular@platinum stars bro! Am not Talking of N’gambi here broda!!! Read my comment with a positive Mind!! U wl get wat am tryng 2 say!! Ok What If some1 is performing better than ”BAGGIO”?? Whats wat we nid in a game of futbol for a team 2 be successfull!! Mind you guyz a good relationship between playerz & coach is very important,because its only ng’ambi who has raised his voice but there is a possibility that even those who chose to remain silent are not in good terms with the coach. Ngati NG’AMBI is guaranteed a place ku club kwake ku platnum stars wat about rusty flames?,Mtawali go home and rest u r drunk. That’s why you’re making us shame because of no guarantee. What we need is a good results not a aguarantee results you have to choose the players that they can perform good. We have a lot of good players. This Mtawali wil for surely fail us! Ng’ambi ndi player wolimbikila, kinna phiri anachosedwa chifukwa chosamulowetsa gaba,,,,,,whether u like or not Ng’ambi is a key player,,,,,mtawali samala. chimwemwe wa ku netball nde uti?,,osamasakanizanso ndi netball izi,,,iyi ndi football ndipo football imafunika kumakhala ndi first 11,,osamangosinthasintha,,Ng’ambi is a star,,,ngati he is guaranteed a place ku club kwake ku platnum stars wat about rusty flames? Yaaa…This will not promote lazyness @ all…. fodya headmaster soul brother > 90min alwez. ntawali akudziwa naeso.